Today, Electronic Health Records (EHR) is placed at the heart of the healthcare sector owing to its ability to generate a complete digital record of a patient encounter along with associated care related activities. EHRs coupled with practice management and billing solutions further ensure smooth functioning and profitability of the medical practice. What healthcare organizations are currently looking for is a combination of these different solutions in order to get the clear recipe for success. iSALUS Healthcare, a provider of cloud-based EHR solutions, offers a product that allows healthcare providers the freedom to practice medicine the way they want to. “We provide users a fully transparent, customizable and Stage 2 Certified EHR solution that can cater to the needs of a number of medical specialties,” explains Michael Hall, Founder and CEO of iSALUS. 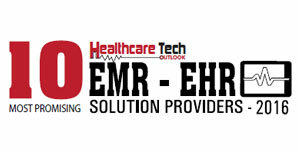 The company’s EHR cloud software solution unifies the capabilities of EHR, Scheduling and Billing together, allowing practitioners to see the patient’s entire clinical history on a single screen. It offers features such as e-prescribing, orders and labs, meaningful use, automated workflows, medications and schedule management all in one place. Additionally, the software is backed by an interactive library of over 2,000 templates, “Our solution is completely elastic and supports 42 different medical specialties,” asserts Hall. iSALUS also provides mobility to users by offering vital patient information from anywhere and anytime on iPhones. The iSALUS iPhone app features patient medical records, secure communications, charge capture, dictation and mobile imaging. “We enable customers to have their office at their fingertips by making all the information from the EHR accessible on their iPhone,” points out Hall. iSALUS’ Billing and Scheduling software enables users to verify patient insurance eligibility, submit e-claims, post electronic remittance advice (ERA) payments, and see patient recall lists. According to Hall, the core differentiator of iSALUS is its easy-to-use design. “Our products are illustration based, so we don’t have a user guide for applications. We believe that if a customer needs training on any feature then the design has failed.” The company’s solutions have yielded promising results for a multitude of clients. For instance, a large nephrology group in Chicago was dealing with a number of dialysis cases where the physicians went to various dialysis centers and wanted a solution to store all the data collected from these centers. iSALUS developed a cutting edge dialysis data capture solution for the nephrology group. The solution provides a suite of tools that allows users to record dialysis types and data points that are necessary to treat other patients. “We have now taken that particular piece of functionality and built a global focus for nephrology practices across U.S.,” states Hall. For the future, the company will vest its focus on innovating the reimbursement model in healthcare. “As patients become consumers of services, they change the way they interact with practitioners leading to new trends in the reimbursement model. We have begun to introduce a lot of tools getting ready for that change.” Further, iSALUS is set to introduce a telemedicine solution into the EHR software to strengthen its existing capabilities.